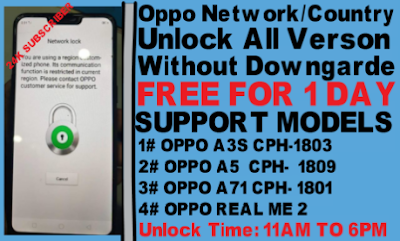 Home / videos / Oppo A3S/A5/Real Me 2/A71 Network Unlock Free For 1day Offer. Oppo A3S/A5/Real Me 2/A71 Network Unlock Free For 1day. Today I am So Happy Bez Youtube Subscriber 24K Complite. Without Your Help Not Possiable. Tommrow I am Gift Oppo All Qualcomm Chip Network Unlock Free. Note: Just For 1 Day Offer for my real Subscriber.Many Friends and other Man selling. If You Buy Oppo Unlock Tool Join Us. Oppo A3S/A5/Real Me 2/A71 Network Unlock Required File. 1# Download Oppo Unlock V3.0 Tool. 2# Send your HWID on Youtube. 3# Download A3s Qcn File. 4# Download A5 Qcn File. 6# Download A71 Qcn File. Oppo A3S/A5/Real Me 2/A71 Network Unlock Method. 1# Install oppo unlock tool. 4# Just Click ok buttion then auto copy hwid. 5# Cmment hwid on youtube then i give you tool key. 6# Open your phone go to dail. 7# Send imei and stamp on youtube. 8# Then i give you Token Namber Free On Comment Replay. 9# Input Token namber then click ok.
10# Then Follow A3s Unlock Same Method. 11# Your all Qualcomm Chip Unlock Done. 12# Free Unlock For Tomorrow 1day offer.